what pouches do you use? Hey guys, me again with more questions... What pouches do you guys carry in the field? how many do you have? and where do you hold them, vest or belt? begining in airsoft i had real trouble knowing what i needed. how many pouches should i buy? and which pouches? how many magazines do you usually carry ? and do you have a pouch with a spare battery? Well mag pouches depend on your weapon and if you have a vest with built in pouches. 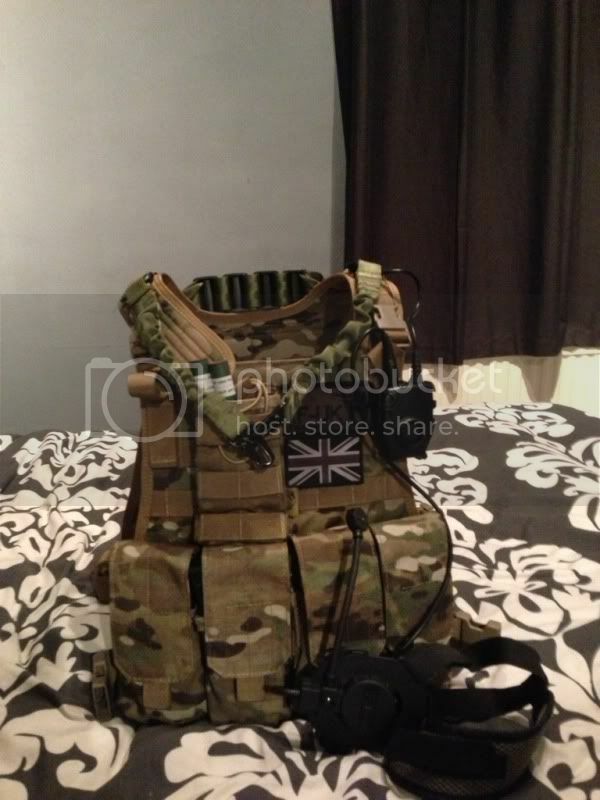 My plate carrier can hold stanag magazines but I use an MP5, so store a spare battery + speedloader in there. I have the MP5 mag pouches on the front for ambidextrous use. I also carry three pistol mags onto the field. Two in a double pouch and one loaded (goes in my pocket when going into the safe zone). This is located on my left side because I hold the pistol with my right hand. And then I have an admin pouch in the top center for keys/map/whatever you want. Thats it really. 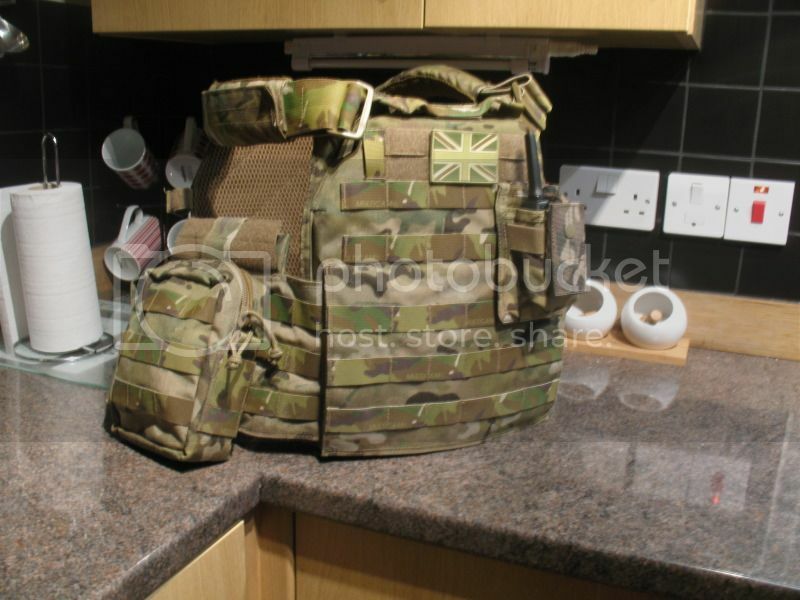 I also have a dump pouch which I will put on a belt one day, as it is too high when on my plate carrier. Plus a utility pouch for a first aid kit (but I dont run this as it is weight, and the games are short). A good tip if you have a sidearm is to keep your strong side clear of pouches. For me this is my right side. When I need to switch to my sidearm there's nothing stopping me from getting to it. Even if it's a dropleg. Some people carry it on the chest though. I use 4 x g36 pouches for 4 single mags, a single m4 pouch for my pyros (grenades) stick type. And a drop leg holster for my 1911 with a spare mag carried on the holster. All mid caps, and I've never even come close to running out of ammo, I know some people who take 4 or 5 hi caps! And still ask do I need more! Madness! On the back I clip a viper folding dump pouch. Single point sling on the UMP and mags in pockets. Nice and lightweight, very easy to use and it beats every other rig I have used. I run a Bulle plate carrier with 4 x double M4 mag pouches, 2 x pistol mag pouches, G18c holster, admin pouch with pistol mag pouch attached, dump pouch and a radio pouch. I use Begadi pouches as they're pretty tough and cheap. Only problem I have with them is the little nylon BE-X labels, although their nothing scissors can't deal with. I carry 3 150rnd MP5 mags in a triple mag pouch, & 1 in the gun, I use a double 5.56 mag pouch as an accessory pouch and a shooting pouch and I'm currently working on a belt/leg rig. also have MP5/MP7 pouches, and all the random stuff like pistol pouches etc from them. The main beef I have with Begadi is the £13 transfer charge they try to get you to pay- it's daylight robbery! Seeing as they have stuff on the main site that they don't ship to dealers it's sometimes worth it. I use mostly Warrior stuff now. Have had pro-force and Defcon5 stuff also. 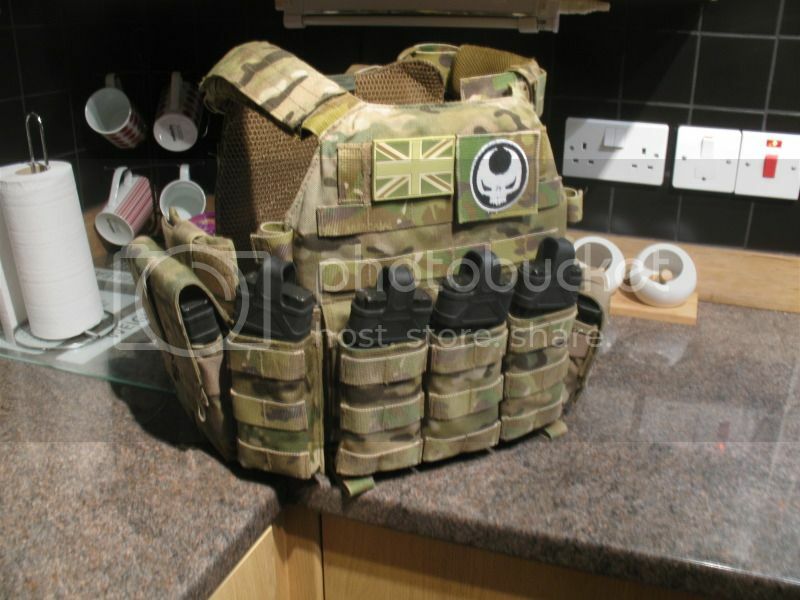 I have a DCS plate carrier with 4 open M4 pouches, 2 closed M4 pouches, double pistol mag pouch, medium utility pouch (spare ammo and batteries.) and small radio pouch. On my PLB belt rig I have Blackhawk serpa holster, double pistol mag pouch, small utility pouch (first aid kit) and a dump pouch. As for the amount of mags to carry it totally up to you. I carry 7 80 rd recoil mids or 5 120 Emags. and have 4 pistol mags. I also have a small and a large speed loader. No point carrying tons of kit you dont need as you are never far from he safe zone. Love an excuse to show it off!! The pockets on my BDU. I do however have two m9 pistol mag pouches on my shoulder holster.I put my sniper mags in my trouser pocket.VSR mags are really light and barely rattle. I also carry a bottle of gas and two speed loaders,the pouch for the gas being velcro'd onto my belt and the speed loaders in my coat pocket. It's very comfy and not intrusive XD. hprentice - The only way you're going to find out how many magazines you need to carry and the type of pouch you prefer is to try out lots of different equipment and configurations. As a basic starting point, look at the type of skirmish site you play most, if it's woodland with longer ranges and almost entirely full auto you'll use a lot more ammo than a CQB site which is almost entirely semi-only. At the woodland site however you might not be too fussed about fast reloads and would possibly be better having your mags more covered up, whereas inside a building you may not need to protect the mags as much and will want to reload quicker. All these things dictate the number and type of mag pouches you're going to want to carry. You can then carry up to 8 STANAGs with the flaps over the mags, or if you want faster reloads and less ammo you just tuck the lids behind the mags (no other mods necessary) so you'll have a capacity of 4 but much quicker access. BULLE kit is solid and you'd have a very adaptable setup. Whenever I needed a pouch, I've been sourcing i 2nd hand for cheapest price I could find, not caring about the looks. meaning my loadout looks a darn mess. today at my belt, since I swapped for hicaps: double pistol mag pouch (multicam, contains a pistol mag and a speedloader), pistol pouch (black, more a pouch than a holster), and utility pouch (tan, using the molle on outside to attach SAK, BFG loading rods and BFG pins on a carbiner, inside is blanks and anything small that I think I might need). a BFG in each front trouser pocket, spare mag in knee pocket, smaller packet of blanks in chest pocket.. set to go! well, might aswell me mention that I use a 1point sling then aswell.. cb. before i swapped you could add a dump pouch, extra dual pistol mag (1 mag 1 battery), bottle pouch for bottle of bbs, vest with 6 pouches that takes 3 mags each, pouches with speedloaders and a pouch for the leatherman.